Chinese rose flower (Yuejihua)-Rosa chinensis Jacq. Part Used & Method for Pharmaceutical Preparations: The flower buds are gathered in June or July in fair weather. Then the buds are opened and dried in the shade. 1. Qi and blood stagnation in the liver manifested as irregular menstruation, dysmenorrhea or amenorrhea. Chinese rose flower (Yuejihua) is used with Chinese angelica root (Danggui), Red sage root (Danshen) and Cyperus tuber (Xiangfu). 2. Scrofula and swellings. 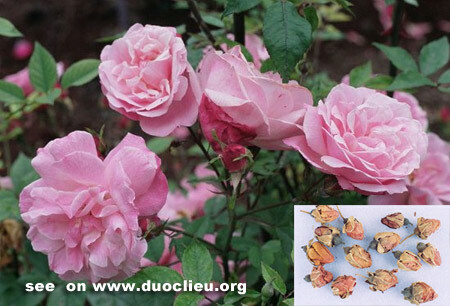 Chinese rose flower (Yuejihua) is used with Prunella spike (Xiakucao), Tendrilled fritillary bulb (Chuanbeimu) and Oyster shell (Muli). Cautions & Contraindications: Excessive use of this herb may cause diarrhea. It should be used with caution in cases with weakness of the spleen and stomach. It is also contraindicated during pregnancy.